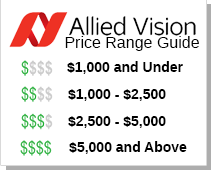 Allied Vision Technologies is one of the world leading manufacturers of high-performance digital cameras for industrial image processing. AVT Gigabit Ethernet (GigE), Firewire, Camera Link, USB 3.0, and CoaXPress cameras offer high image quality, outstanding reliability, and very high value for the money. AVT offers a wide range of machine vision cameras with digital interfaces for industrial inspection, automation, medical imaging, scientific research, traffic monitoring, security, and many other demanding applications. Most AVT cameras come with a 3-year warranty. Note on AVT Camera Pricing: Due to contractual arrangements between AVT and RMA Electronics, we are not currently permitted to display pricing online for AVT products. Please contact us directly for this information. Bonito PRO X-1250C AVT 4/3" Progressive Color CMOS (OnSemi PYTHON 12K) Camera, 12.5 Megapixels, 4096 × 3072, 142.6 fps, F-Mount (Default), CoaXPress (CXP-6) New! Bonito PRO X-2620B AVT Type APS-H Progressive Monochrome CMOS (OnSemi PYTHON 25K) Camera, 26.2 Megapixels, 5120 × 5120, 79.7 fps, F-Mount (Default), CoaXPress (CXP-6) New! Bonito PRO X-2620B NIR AVT Type APS-H Progressive Monochrome CMOS (OnSemi PYTHON 25K) Camera, 26.2 Megapixels, 5120 × 5120, 79.7 fps, F-Mount (Default), CoaXPress (CXP-6), NIR Optimized New! The Mako U is an inexpensive USB 3.0 camera with a compact housing. USB 3.0 technology has lower latency and jitter times with less CPU load than other camera interfaces. Typical applications for Mako U cameras include machine vision, quality control, inspection, surveillance, industrial imaging and much more. The Mako is an industrial GigE camera with an excellent price/performance ratio. Mako cameras have the same compact form factor (29mm W x 29mm H x 60.5mm L) and the same mounting positions as many analog cameras. All models include PoE, three optocoupled outputs, and a 64 MB image buffer. The image quality profits from the precisely aligned sensors. Camera resolutions currently range from VGA to 4 megapixels - with various models using both CCD (Sony) and CMOS (CMOSIS) sensors. The Manta is a flexible, feature-rich GigE Vision camera with an outstanding price/performance ratio, with many models under $1,000.00. The Manta Series uses Sony CCD and CMOSIS CMOS sensors - ranging in resolution from VGA to 9 megapixels. Most models are now available with optional Power Over Ethernet (PoE). The Prosilica GT are compact digital cameras designed for imaging in extreme temperatures (from -20C to 60C) and fluctuating lighting conditions. The Prosilica GT cameras feature Precise (P-Iris) and DC Auto-Iris, as well as PoE and the latest CCD sensor technology making them ideal for a wide range of demanding applications including ITS & traffic imaging, machine vision, industrial inspection, security, surveillance, military applications, and more. Technical Note: Prosilica GT Series cameras offer a P-Iris feature for precise lens control. To learn more about P-Iris technology, please refer to the AVT Technical Paper. The Prosilica GX cameras are fast, compact machine vision cameras with Gigabit Ethernet interface (Gig E Vision). The GX Series have two scew-captivated Gigabit Ethernet ports configured as a Link Aggregation Group (LAG) to provide a sustained maximum data rate of 240 MBytes per second. The Prosilica GX can also work at half the bandwidth (120 MB/s) using a single cable. The Prosilica GC cameras are ultra-compact, high-performance machine vision cameras with Gigabit Ethernet interface (GigE Vision). With its ultra-compact package, GC cameras are available in VGA to 5 Megapixel resolution, offer fast frame rates up to 119 fps, and are available with both CCD and CMOS sensors. The Guppy Pro is the latest next generation series of Firewire B (IEEE 1394b) cameras packaged in an extremely small robust metal housing. Guppy Pro models are offered in VGA up to 5 megapixels, with excellent price/performance ratio, with most models being under $1,000.00. RMA Electronics, Inc. is permitted by AVT to sell their cameras only within the United States, Canada, Central America, and South America. For all other regions of the world, RMA Electronics, Inc. is not permitted to sell AVT cameras.